Daboia is a monotypic genus of Old World venomous vipers. This genus was made for the species "Daboia Russelii", also known as the "Russell's Viper". It was named after Patrick Russell (1726-1805). Patrick Russell was a Scottish herpetologist, who studied many Indian snakes. The name, Daboia, is a Hindi (the main language of India) word meaing "that lies hid". The Russell's Viper is not only one of the four most venomous snakes in India, but it also causes the most deaths out of all the venomous snakes. There is currently one subspecies found, not including the nominate subspecies. Russell's Vipers can grow up to the length of 166 centimeters (5.5 ft), but they are usually around the length of 120 centimeters (4 ft). The Russell's Viper is usually dark yellow or brown in color with many black spots. The Russell's Viper is found in India, Pakistan, Sri Lanka, Bangladesh, Nepal, Myanmar, Thailand, Cambodia, China (Guangxi, Guangdong), Taiwan, Indonesia (Endeh, Flores, east Java, Komodo, Lomblen). But some say it is also found in Vietnam, Laos, and the Indonesian island of Sumatra. The Russell's Viper is found in open grassy and bushy areas, farmlands, coastal lowlands, plains and hills. In English they are known as the "Russell's Viper", the "Chain Viper", the "Seven pacer snake", and the "Scissors snake". In Urdu, Hindi, Hindustani, and Punjabi they are known as the "Daboia". In Oriya they are known as the "Chandan Boda". In Kashmiri they are known as the "Gunas". In Sindhi they are known as the "Koraile". In Bengali they are known as the "Bora" or the "Uloo Bora". In Gujarati they are known as the "Chitalo" or the "Khadchitalo". In Marathi they are known as the "Ghonas". In Telugu they are known as the "Katuka rekula paamu". In Thai they are known as the "Ngu maew sao". In Burmese they are known as the "Mwe lewe". In Tamil they are known as the "Kannadi viriyan". 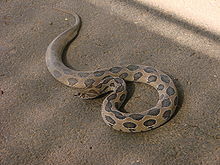 The Russell's Viper is Terrestrial (lives on the ground) and is usually nocturnal, but in cool weathers it is diurnal. When threaten it raises its head and makes a hissing noise which is said to be louder than other snakes. Their bite may sometimes be a simple snap, or sometimes the jaws hang on to the enemy for a few seconds. Adults are said to be slow and sluggish but when disturbed they become aggressive. Since of its aggressiveness and venom many animals and people are scared of this snake. That is why another snake, Rough-scaled Sand Boa, mimics the color pattern of the Russell's Viper so it looks like the Russell's Viper, but it is actually harmless. Adult's venom glands hold around 21–268 mg of venom, while young one's venom glands hold around 8–79 mg of venom. The Russell's Viper eats just about everything; it eats rodents like rats, mice, and squirrels, land crabs, lizards, shrews, scorpions and other arthropods. Young Russell's Vipers are said to be cannibals, meaning they eat each other. The Russell's Viper is viviparous, meaning they give live birth. They mate early in the year and a female is pregnant for around six months before giving birth to her young in May to November, but usually in June or July. A female gives birth to around 20-40 young at a time, and the young are around 215-260 millimeters long when they are born. A Russell's Viper becomes mature after around 2–3 years. Not including the nominate subspecies, the Indian Russell's Viper (D. r. russelii), there is only one subspecies, the Eastern Russell's Viper (D. r. siamensis). This page was last changed on 10 October 2017, at 14:02.